This was one of my first shirt designs. 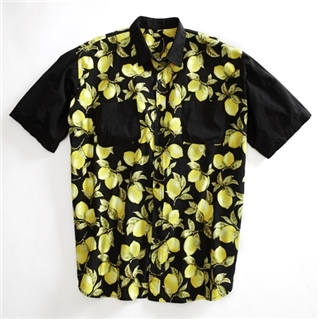 I thought it would be cool to have a shirt that was made out of a nice lemon quilting fabric. I thought the lemons were set off well with the black fabric. This shirt is still a decent attention getter and a great shirt for summer.This shirt seems to capture the zeitgeist of warm August days so well. This shirt might make it into production; it just depends on how much positive feedback it gets. Send us your thoughts.